Nargisi Kofta Curry, Nargisi Kofta recipe is an awesome dish which will be a perfect dish for the party table. Royal, Elegant, Delicious, this dish will be an amazing curry that goes well with chapati, naan, any kind ofrice, pulaos or parathas. 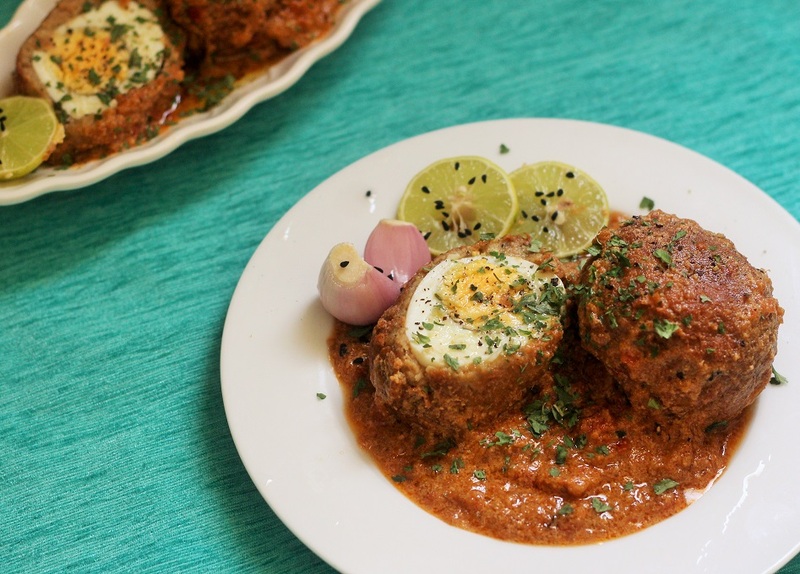 This nargisi kofta curry gravy is made from onion, tomato, yogurt. It needs very basic and usual spices. The gravy is smooth, creamy and rich. Addition of cashew nuts makes it rich. But the star of the dish are the eggs coated with the mutton mince. You can even add some cream to give that extra richness if you want. But it tastes fantastic even without the cream. The crispy, outer mince layer, and soft and creamy eggs in the center, are simply yummy. It is always a celebration time when there is nargisi kofta curry, so do not wait for any occasion and whenever you feel like celebrating make these melt in the mouth koftas. The koftas themselves are so tasty even without the curry that they can easily be served as a snack too. I prefer to refrigerate the mutton keema for sometime as it helps to bind over the egg properly. So it is always a good idea to refrigerate. In a large mixing bowl, add the mutton mince, 1 onion, garlic paste, turmeric powder, 1/2 tsp red chili powder, 1/2 garam masala powder, 1 egg, and besan. Mix thoroughly or put it in the food processor till thoroughly mixed. Keep it refrigerated for at least 30 minutes. Heat 2 tbsp oil in a kadai and add onion and fry till light golden. Then add, green chili, ginger and garlic paste. Fry for another minute till the raw smell from the ginger garlic paste vanishes. Now add red chilly powder, coriander powder, garam masala powder and salt. Put 1/4 cup of water so that the masala mixes well. Add tomato paste and let it simmer on medium heat for 8 - 10 mins or till oil separates. Add the fried koftas and the cashew nut paste with a cup of water and simmer for couple of minutes.